Invite students to keep a journal or diary. You might begin the process by making small journals during the last days of the year for students to fill during the summer. Older students might keep blogs on one of the many free online sites. You might suggest that students write about their readings, special events, or simply day-to-day activities. Suggest students create their own comics with the Comic Creator or drawing their comics by hand. Students might draw favorite or missing scenes from their readings, create original comics for existing (or new) characters, and compose comics from events from their summer activities. Demonstrate how students can use the ReadWriteThink Printing Press to create newspapers, brochures, flyers, and booklets. Whether they are responding to readings, films and movies, televisions programs, or personal events, students can use the Printing Press to publish their thoughts. Additionally, students can create family publications about vacations or special events, publications with their friends about hobbies or special trips, and personal publications that focus on their special interests. Have students create alternative book covers or CD/DVD covers for books they have read, albums they listen to, and films they have seen. Or have students create original covers for their own writing, playlists they compile, and films they make (or would like to see). Ask students to write letters to friends, family, and one another using the Letter Generator. Students might use the tool to compose letters to family members in other parts of the country or to share details from their vacation with friends at home. Tap students inner muses by asking them to compose original poetry about their summer activities using the Acrostic Poem, Diamante Poem, or Shape Poem tools. Invite students to create their own postcards for places they visit or would like to visit using the Postcard Creator. In addition to sharing images and words on the trips they take, students can also make postcards that might be sent by characters in books they read and films they see. Do you have additional summer literacy activities that you suggest to families? Id love to hear from you, whether you suggest specific reading activities or books, encourage composing over the summer months, or urge families to explore literacy with photographs, films, or other media? Just use the comment feature here to tell me about summer learning activities that you have suggested to families and the feedback you’ve received. Literature can provide powerful support for us in times of trauma and sadness. In the Teaching English in the Two-Year College article “Literature of Survival: A Literature Class as a Place for Healing,” Kate Dailey explains how literature can provide models and guides for readers searching for ways to make sense of traumatic experiences. When Nikki Giovanni was asked to speak at the Convocation at Virginia Tech (audio of poem , transcript of poem , convocation video) a week ago, she could never have predicted the way that her poetry would prove a healing salve for the community. Overnight, words from Giovannis poem appeared on handwritten posters, on professionally-made banners, on tshirts, on full-page newspaper tributes, and on car windows. When I visited the Virginia Tech Department of English yesterday, a colleague confessed that Giovanni was amazed by the way the poem has been adopted by the community. As an English teacher, I too am amazed. Its rare to see a poets words splashed across an entire community, but Giovannis reading at the Convocation has become the rallying moment for students, faculty, staff, alumni, related families, and the greater community. When Giovanni said, “We will prevail,” we all believed her. Daileys Teaching English in the Two-Year College article emphasizes why literature can have such a powerful effect: it provides a model for healing, guiding readers through the process of remembrance, mourning, and reconnection. English teachers know that literature touches lives. In this last week, weve gained powerful evidence of just how deeply literature can touch us all. 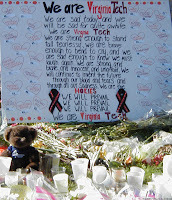 When I heard the audio and I saw the images of the Virginia Tech campus yesterday, I burst into tears. My school, my campus, was under attack. I earned a BA from Virginia Tech in June 1984 and an MA in August 1986. I taught in the Virginia Tech English Department for two years as a graduate teaching assistant and for seven years after I earned my MA. As the images streamed across my computer screen yesterday, I saw buildings that I have been in. I knew people I taught with were in buildings near Norris Hall, and, worse, that my family members were literally across the street from the classroom building and dorm where the attacks took place. In his Voices from the Middle article “Difficult Days and Difficult Texts,” Bob Probst talks about the value of stories. “Stories,” he tells us, “will save us, if anything will” (50). Right now I am struggling to find the stories. More than anything, I want a story that will take this tragedy and make sense of it. Writing of the events of September 11, but just as applicable to the shootings in Blacksburg, Virginia yesterday, Probst explains, “Part of the problem with understanding . . . was that we had an event, but didn’t yet have a story. All we had at that point was an image, a happening” (53). The world has an event right now. If Im honest, I have to admit that I never really “got” graphic novels as a student. I just couldnt get into reading them. Looking back, I think the problem was that I didn't have the literacy skills necessary to read them. I just felt bombarded with images and words, and didn't have the critical reading skills that would help me understand the texts. Today, I “get” graphic novels, but my experience has taught me that students need support if we want them to engage with graphic novels in sophisticated ways. Sometimes, students need background information in order to understand the world of a graphic novel. New this month on the ReadWriteThink site, the lesson plan Gaining Background for the Graphic Novel Persepolis: A WebQuest on Iran explores the cultural and historical information that students require if they are to make the most of Marjane Satrapis graphic novel. Students also need to comprehend the structures that graphic novels and comic books use. The ReadWriteThink lesson The Comic Book Show and Tell combines writing instruction with tools that identify the different parts of comics and explains how they work. The lessons Comic Vocabulary Interactive (Flash plugin required; PDF versions also available in the lesson) includes examples and explanations of comic and graphic novel components that can be used at any level. The sample chapter from NCTEs new book Building Literacy Connections with Graphic Novels: Page by Page, Panel by Panel includes teaching suggestions for pairing Spider-Man comics with Freak the Might and comments on teaching Maus I and Maus II. Graphic novels and comic books provide rich opportunities to explore multimodal literacy. Theyre anything but simple. The sophisticated relationships among images and words and layout encourage deep thinking and critical analysis. If we can help students “get” graphic novels, we will simultaneously teach them the literacy strategies they need for navigating many of the other multimodal texts they encounter in their daily lives. I can usually stop it at that point, and yes, I honestly recite the poem in middle English. Im a medievalist at heart, and as a student, I memorized and performed lines from The Canterbury Tales. The words are alive and fresh for me. In a world where poems seem to be dead words upon printed pages, students may find it odd for a poem to live and breathe for a reader; but poetry performance can bring such energy to a text that, as The Canterbury Tales has for me, it can stick with readers for years. .As we encourage students to explore poetry with the many 21st Century literacy skills that are part of their world, they may perform sonnets as rap or compose video explorations of haiku. A free-verse poem may rethought as a PowerPoint slide show illustrating the various images in the poem. We can ask students to set favorite poems to music, to create theatrical presentations of poetry, and to illustrate the poems they enjoy. Even a simple podcast of a poem can be expanded sound effects, background music, and the readers vocal expression. When we ask students to perform and explore poetry in such ways, we help ensure that poetry is always a living thing for students.